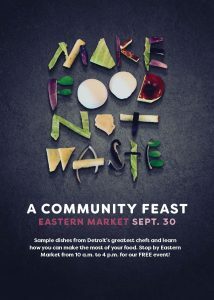 Peace, Love & Planet is proud to be a part of Detroit’s first Make Food Not Waste–A Community Feast. Join us on Sunday, September 30 from 10am-4pm at Eastern Market’s Shed 5 as we explore ways you can easily make your food go farther in your kitchen. Sample delicious dishes made by local, celebrity chefs from food that would otherwise go to waste. Be inspired by chefs showing you how to make the most of your food. And learn simple ways to stretch your food dollars. You’ll leave with a full belly and lots of new ways to cut down on the amount of food that goes to waste at home! Admission is free for this one-day event. For more information visit EventBrite and follow us on Facebook.